TOKYO — This was his moment, but they had to be a part of it, knowing what it meant to him and to baseball. 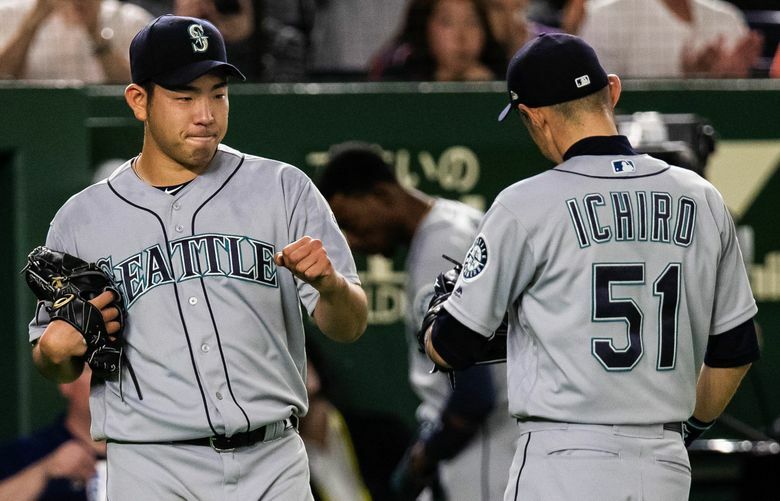 Ichiro’s teammates couldn’t ignore his somewhat abrupt, if expected, retirement Thursday after the Mariners’ final game in Japan. And their fondness for the 45-year-old legend made it a night to celebrate, not lament. 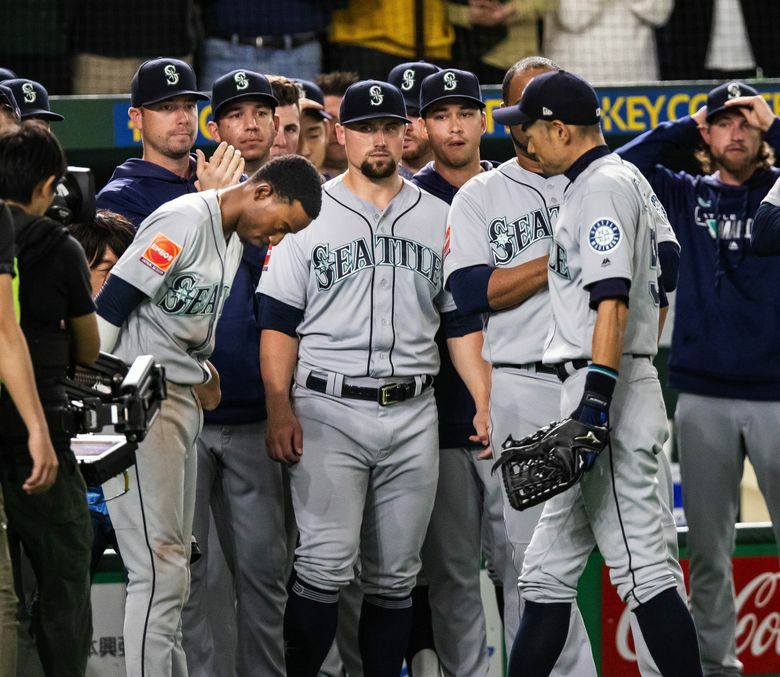 After Ichiro’s emotional and applause-filled exit between the top and bottom of the eighth inning — and Seattle’s 5-4 win in 12 innings — his teammates followed him into a small media center setup near their clubhouse in the Tokyo Dome, where he officially announced his retirement. His teammates applauded him, then urged him back onto the field, where more than three-fourths of the 46,000 fans crammed into the stadium continued to cheer. 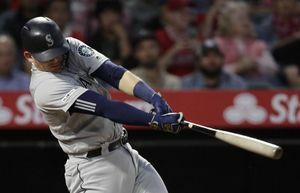 As he took the extended curtain call, Mariners players chronicled the event — the videos destined for social media and their personal archives. “This is unbelievable,” said Braden Bishop, the player who replaced Ichiro in the eighth. Healy watched from the dugout in the top of the eighth inning of a 4-4 game with Ichiro at the plate and Tim Beckham on second. He ached for Ichiro to get a base hit to score Beckham with the go-ahead run. Ichiro couldn’t quite beat out an infield hit on a ground ball to shortstop, coming up a step short on a play he would’ve beaten out five years ago. Even former players got into the act. 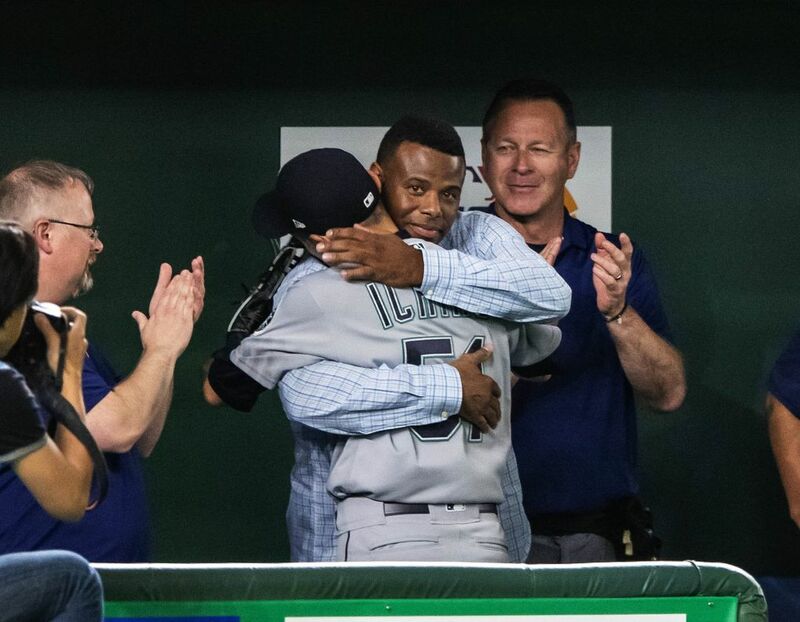 Ken Griffey Jr., on the trip as an ambassador and not a coincidence to the circumstances, was in the dugout in the eighth, giving Ichiro a hug. Griffey, who retired in the middle of the 2010 season, had some simple advice for Ichiro in retirement. 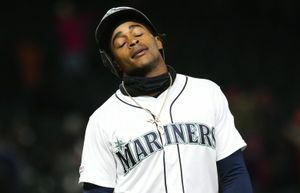 Like new Mariners pitcher Yusei Kikuchi, the emotion was a bit too much for Dee Gordon. 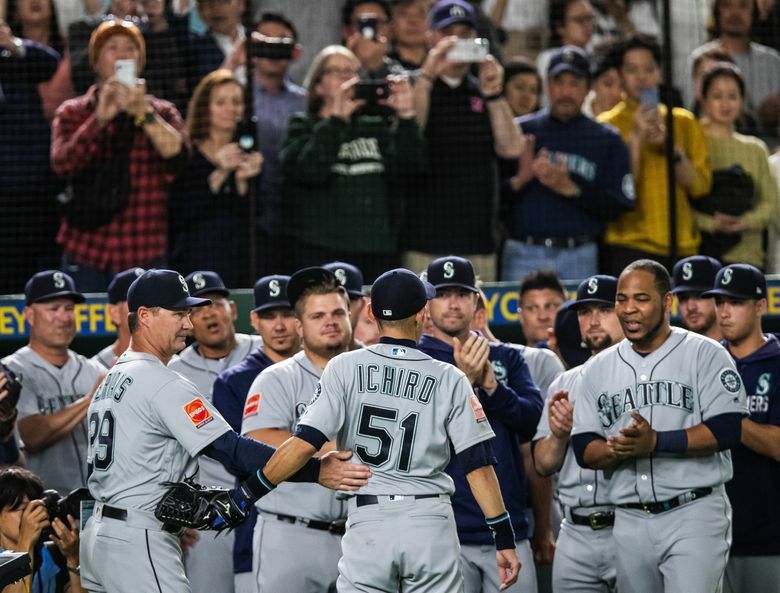 TV cameras showed tears streaming down Gordon’s cheeks after Ichiro demanded a hug from him instead of the traditional Japanese bow. But Gordon knows his friend deserves those tears. They first met when they played together with the Marlins. Two men with different backgrounds, the universal language and binding qualities of baseball brought them together. They were two players with speedy, smaller frames who could seemingly make contact with their left-handed swings on any pitch, sometimes to their detriment. Sometimes heroes can break your heart when you meet them. But Ichiro didn’t disappoint. Asked to put into perspective what Ichiro meant to baseball, Gordon kept it simple.